October 19, 2018 / Modified oct 22, 2018 5:01 p.m.
AZPM launches new radio station in Cochise County and a free preview screening of Native America. 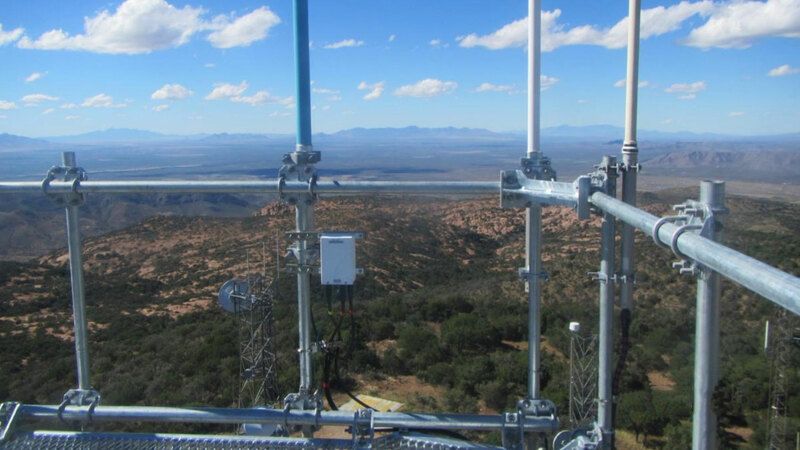 A view from the top platform of the new AZPM radio tower in Cochise County. I am pleased to report that we recently completed construction on a new radio transmission facility that will ensure audiences in Sierra Vista, Bisbee, Hereford, Benson, Wilcox, Douglas, and surrounding communities will receive AZPM’s local and regional and NPR national programming. On October 12th, KUAS 88.9 FM began offering program services to the region, providing AZPM and NPR news and information programming from 5:00 a.m. – midnight, and the BBC World Service during the overnight hours, from AZPM’s studios based at the University of Arizona in Tucson. The 88.9 FM frequency originally carried Classical 90.5 FM programming to residents of Bisbee. During the transition, classical programming will be taken off the air temporarily while we apply to the FCC for a new frequency. Listeners can still enjoy classical programming with an HD radio through the HD2 frequency 88.9-2 and online at radio.azpm.org/classical. We apologize for the inconvenience and appreciate your patience as we work to improve our service to southeastern Arizona. On October 17th, AZPM hosted the candidates for Arizona’s Congressional District 3 in the last of our Your Vote 2018 debate series. As the mid-term elections approach, I encourage you to follow our statewide campaign coverage at news.azpm.org/yourvote. And stay informed about the issues with AZPM’s public affairs programming Arizona 360 on PBS 6 and The Buzz on NPR 89.1 FM. And finally, AZPM will host a preview screening of the new four-part PBS series Native America on October 22nd. Lindsay Montgomery, Ph.D., University of Arizona Assistant Professor of Anthropology, who served as a production adviser on the series, will lead a discussion. The event is free and open to the public, but seating is limited. For more information and to reserve your seat CLICK HERE. Thank you for your continued support in our mission to bring relevant, informational, and educational programs to our audiences in southern Arizona.